Grade I-winning millionaire Kicken Kris has always been up for learning something new. The 14-year-old transitioned from racetrack warrior to Japan-based stallion, and is now trying his luck at a third career as an event horse in Pennsylvania. 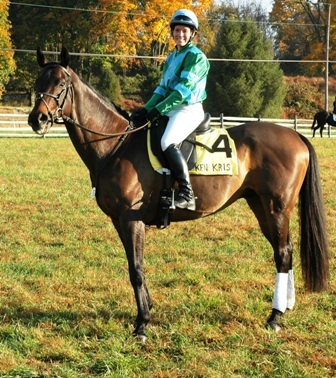 "He's very bright and the stamp of an event horse," said Jane Sleeper, who keeps Kicken Kris at her farm near Gum Tree, Pa., where he has learned to fox hunt, jump, and perform cross country and dressage. "He's so athletic and tractable." Even as a baby, Kicken Kris seemed destined for great things. An eye-catching yearling, he fetched $400,000 from Elizabeth Moran's Brushwood Stable at the 2001 Keeneland September yearling sale. Trained by Michael Matz for Brushwood, Kicken Kris took six starts to break his maiden, but then everything seemed to click. He became one of turf racing's top runners from 2003-2004, winning the Secretariat Stakes (gr. IT) and the Lawrence Realization Handicap (gr. IIIT) at 3, and then adding victories in the Arlington Million Stakes (gr. IT) and Bowling Green Handicap (gr. IIT) at 4. Kicken Kris, who placed in four other stakes, including the Hollywood Derby and Gulfstream Park Breeders' Cup Handicap (both gr. IT), retired from racing with a career record of 6-3-3 from 19 starts, for earnings of $1,326,600. Although Moran preferred to stand Kicken Kris in North America, she received an offer she couldn't refuse from Japan, and sold her decorated racehorse for stallion duty to the Hidaka Breeders Association. But, in a noble move, after Kicken Kris had stood eight seasons at Japan's Mombetsu Stallion Station, Moran bought him back and shipped him stateside for retirement. "He had an unremarkable stud career for a few years and thinking that he might be in danger, Mrs. Moran negotiated to bring Kicken Kris safely back home," explained Mona Phillips, office manager for Brushwood. 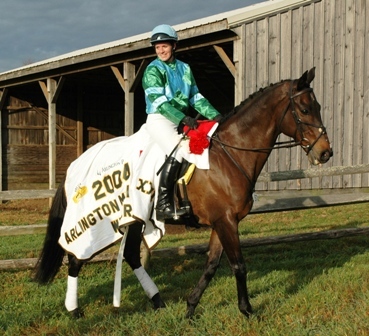 Kicken Kris was gelded before he came back, and spent time getting acclimated at Rigbie Farm in Maryland once on United States soil. "He is doing very well and hopefully, after quite an exciting life so far, he will be useful in his new career," said Phillips. "He is has been with Jane Sleeper since he came back to the states, and she has been acclimating him from a life as a former stallion to that of a hunter or event horse. You can imagine the adjustment has been quite a journey, but he is doing very well." 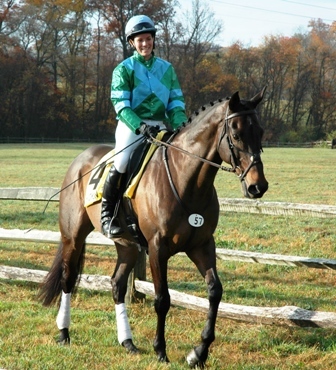 Sleeper, a longtime trainer of off-track Thoroughbreds, said Kicken Kris relished the group setting of fox hunting, so she decided to expand his skill set to include eventing. "He really took to it," Sleeper explained. "He's a nice mover and very athletic. We've done mostly starter horse trials, baby novice, and novice events. He's also done a couple of training level events." Kicken Kris' biggest competition to date was in the Nov. 2 Plantation Field November Starter Trials, where he was ridden by Ashley Steele. 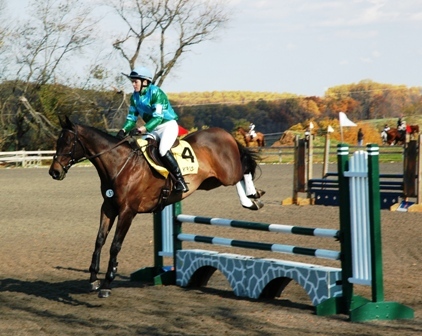 Phillips, Moran, and Matz all attended the event, which took place at Plantation Field near Kennett Square, Pa.
"He finished ninth but would have been higher if he hadn't refused the first show jumping fence," explained Phillips. "He went on to a clear round in the show jumping and cross country and had a 33 dressage score." The event had a Halloween theme, so Kicken Kris' connections dressed him in his Arlington Million attire. 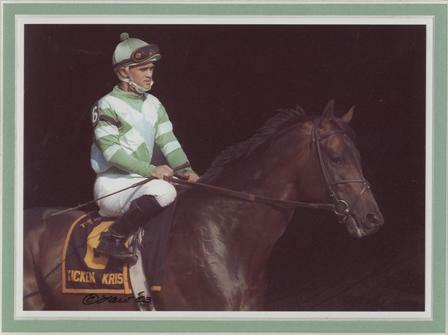 "He had the number 4 on his saddle cloth, a yellow saddle pad, and wore a blanket of red-and-white carnations for winning it," said Sleeper, adding that Steele also donned Brushwood's green-and-white silks. Sleeper described Kicken Kris as a curious horse that is always ready for a new challenge. 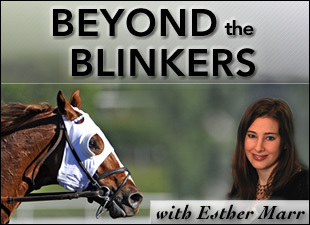 "As he got more into (eventing), he would get more inquisitive," said Sleeper. "I think he's a likeable, wonderful horse; I really think a lot of him. He has a nice attitude and a wonderful face." In addition to being ridden in competitions by Steele, Kicken Kris was recently leased by another rider that took him to some jumping events. Moran is currently looking for an additional lessee to expand her gelding's resume. "Mrs. Moran would like for Kicken Kris to be busy and useful, but otherwise she'll give him a forever home," Sleeper explained. Sleeper, who started out riding Western style with barrel racing and pole bending while her family was based in Hawaii, acquired her first Thoroughbred while in high school. "I exercised racehorses and loved being around them," she said. "I really enjoy the Thoroughbred, because I'm a lazy rider...I like to think it, and they do it." Sleeper's father was in the military, so she lived in several different states while growing up, including Ohio and Virginia, where she met racehorse owners that sent her their retired Thoroughbreds to re-train. "You have to be careful with Thoroughbreds when they came off the track to make sure they don't have (an injury) there that you didn't see," said Sleeper, who is also currently re-training Brushwood's retired stakes winner Mr. Ryder. "I enjoy (OTTBs)...they have good senses of humor, and they like to work." As for Kicken Kris specifically, Sleeper believes the sky is the limit for the inquisitive gelding. "I think he could do whatever someone wanted to put him toward," she said.